We sat down with British producer SBTRKT to talk middle-of-nowhere UK locations, hallucinogenic animals and the anonymity of a mask. 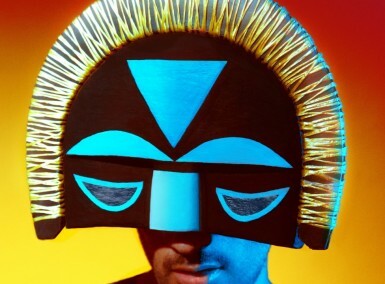 Electronic artist Aaron Jerome aka SBTRKT has come a long way since his 2011 debut effort. He’s produced a number of brilliant remixes,worked with some of the industry’s biggest names and his shows have gone from a one-man effort to a full-blown live band, resulting in an dynamic display of taking a studio on the road. 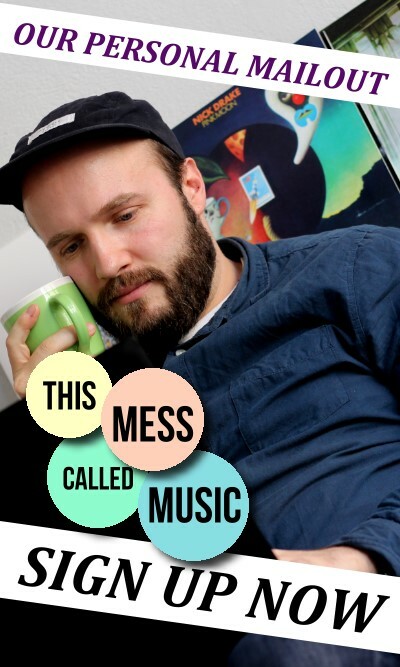 For Wonder Where We Land, he’s employed a range of stellar vocalists including frequent collaborators Sampha and Jessie Ware as well as VAMPIRE WEEKEND’s Ezra Koenig, CHAIRLIFT’s Caroline Polachek and A$AP FERG. Newcomers include RAURY and DENAI MOORE. 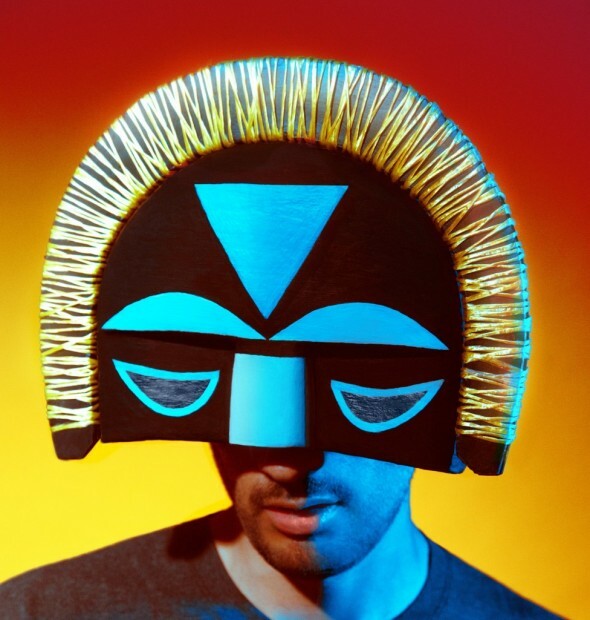 Whilst the anonymous masks designed by Hidden Place were central to Jerome’s debut album, his latest offering is not only his most collaborative effort to date, it’s also testament to SBTRKT’s development as an artist, his ability to work with musicians across genres and bring out the best in them – and himself. So you’ve made a bunch of changes to your live show – that would be a really fun place to start. There’s a giant dog and loads of people with you on stage now. We saw you at MELT! this year and at your first MELT! appearance on the MODESELEKTOR stage. Wow, that was a long time ago. I really liked that show even though it was so basic and so many years ago. 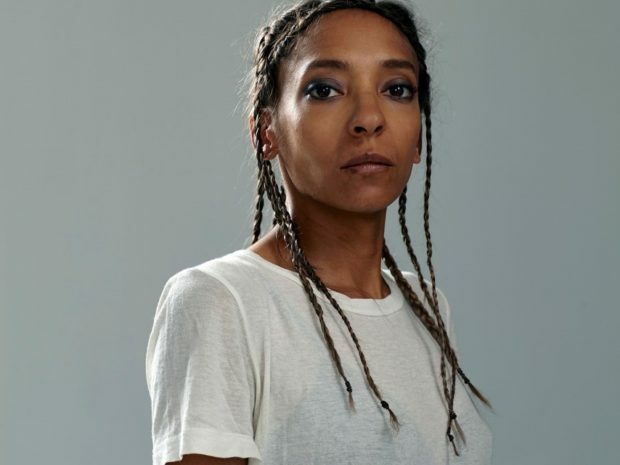 Maybe you could tell us a bit about the process from a one man show with SAMPHA doing some vocals – that seemed to be very electronic and it’s moved onto something that now reminds me of GROOVE ARMADA – a big live band. I suppose I wrote my first album in 2009 and 2010 and released it mid 2011 and had been DJing for a lot of the time preceding that and I started playing with the idea that I wanted to perform it live. I’d done baby steps towards that in the year preceding and having written with SAMPHA, I wanted to try jamming stuff out live. We just wanted to see what would happen; we had some successes but we didn’t have a concede effort to have a live band. Then the album came out and part of my dream of making music – something I hadn’t achieved up until that point – was to be able to perform music live; and I don’t mean just demand bigger fees and perform on a big stage – it was the fact that you could take music on the road and perform it live with electronic music, with some mixture. I couldn’t think of anyone comparable (apart from classic bands like PORTISHEAD or MASSIVE ATTACK), there was nothing else that was filling that sort of space. So I spent about two years touring it with SAMPHA and it was a large development from the beginning where we played at the Hoxton Bar & Grill to fifty people up to the end where we ended on two nights at Shepherd’s Bush Empire and all the festivals. It was quite an experience in building something very different to create an album. I wanted to showcase a different side of live performances, actually building a song in front of a crowd versus it being something that has to be pre-programmed as I am playing the track as it is on the record. It’s sorted of introducing the idea that you could play a song to an audience and they might see parts of that song being built on the fly. We did it both successfully and unsuccessfully, as there were only two of us on stage. It was really exciting in a dynamic and visual way – everytime we performed there was so much going on at any given time. That element is what I really loved about performing and I didn’t want to miss that in the show, I didn’t want anything to slow down. Obviously- since and in between- SAMPHA’s been an artist in his own right, I wanted to created a new footing of live shows which wasn’t necessarily fronted by anyone but where the instrumental basis would be just as exciting. A friend of mine ended up playing drums for me and I’d ended up on synths and keys and another friend now plays keys and percussion. My idea now is basically taking a studio on the road; it’s that amount of gear. We’re only a few days into the tour but we definitely set a precedent in trying to make something that’s going to dynamically change and grow. But I’d say – a year from now – it could be a totally different thing to what it is now. The live show is as much of an experimental thing as making music should be. It should change and adapt, I like the idea that it’s a constant moving thing. That sense of movement… Let’s expand on that. That comes across on the new album; the first album sounds like a computer album whereas with this one there’s things poking out in places. I don’t know if that’s an effect of playing live? Yeah, the last record I toured considerabl,y so that influenced me a lot in terms of what I wanted to put across on the new record – making a hybrid between live and electronic music. For this one I wanted to make more of a conceited effort, it’s more of a concept album. I brought collaborators into an environment that was slightly out of their comfort zone – and mine. I wanted to be a free-form jam thing. I found this place just off the coast of Essex called Osea Island. Its uninhabited but there’s a summerhouse, which I converted into a studio area for two weeks. I brought in a drum kit and analogue synths and it was really fun to bring in people and see what happened in that space. We had the freedom that nothing was tied to a sequencer or a computer, rather we’d recorded things in one take and leave it as soon as it was done and roll onto something new. That was how the bones of the album came about – Wonder Where We Land, Look Away, If It Happens and Gon Stay. With this album I wanted to make an immersive record, which sort of broaden the horizons of what I like in terms of genre. For me, it’s giving the album a sense of identity more than what you do as a producer in a room. I had a lot of conversations with WARPAINT about collaborating with them over a period of two years but nothing happened. Then it turned out they were up for experimenting so I went out to L.A. Stella and Emily were there and I’d take an idea of a piano riff and see how they’d react to that. I used elements from that and took them home and also to New York for the sessions with A$AP FERG and Ezra from VAMPIRE WEEKEND. Voices In My Head which A$AP is on is also part of the drums from the L.A. sessions and Emily’s reverb and seeing how Ferg would react to that. It became this cross-collaborative process. A lot of the album, unlike the first, is live takes and overlaid. For me, my keyword is immersive. To create something that’s surrounding you, that pans around you and makes you picture more. That’s also largely related to the instruments I used and the people I worked with, who brought out a different identity of themselves because of the situation they were in. It’s a challenging album for those who have been engrained in album one. I have no idea how people will respond on the whole to the change. It’s not something I’m trying to run away from, I just need to constantly evolve as a musician. Where I am on my next record, might be where neither of these are – hopefully it won’t be a folk-rock album (laughs) but it’ll be something else. Let’s talk about ‘Transitions.’ You were recording more instrumental stuff before your debut and ‘Transitions’ acts as a bridge between the two. Yeah, well essentially I write a lot of music between albums but when you get into that cycle, it’s very hard to let music go without people judging it based on it having to be a certain level of success, I suppose. People are expecting me to release the next Wildfire and they don’t want to hear things in between. You kind of have to categorise things to make sense of it for people. Transitions was definitely something I wanted to put out there… it was something that captured a mood and a point of what I’m trying to do in between and what I do around my albums. How long did you work on ‘Wonder Where We Land’ then? You’re quite an elusive man in regards to finding stuff out online and with the masks, there’s perhaps an element of shyness…? … I’m not, I don’t think so… I think it’s about preserving and taking control of what’s achievable and what you can do in performance as well as recording. It’s a hard one. For the last one, I felt the mask and the anonymity was a very important part of what I tried to create as an artist and what music is about for me. I felt like with a bunch of collaborators, it’s not really about a single identity, it’s not about me, it’s about the joint process of it happening. Taking a focussing as an individual is unfair to the whole and it also stifles that things will move forward because then it’s about me rather than the overall plurality of SBTRKT. I think in terms of a live show, to avoid things having to be vocally fronted and taking more ownership, I’ve learnt a lot through performance over the last couple of years to take it to another level and to go somewhere further than that – more free form almost. It’s inherently very urban music yet I’ve you come from a little, middle of nowhere town in the UK. Whereabouts are you from? (laughs) Well, I grew up on a farm between Bedford and Cambridge but I’ve spent the majority of my life in London since then. But yeah, I always gravitate towards weirdly electronic music even since I was about ten years old. I don’t know how or why because there was nothing surrounding me that played that (laughs). I suppose it influences the space in my music. I grew up in an isolated space with no neighbours; we didn’t live in a village or a town. It sounds like I’m name-dropping here but I had a conversation once with BAZ LUHRMANN because I did a bit of the soundtrack for The Great Gatsby. Just once, it was the only person I’d ever met like that (laughs) I was talking about growing up on a farm and he did too and he reckons it makes you more creative, because as a child you have to make more things up in your head. I guess he makes a point that you have to imagine things more. With my music, I feel there’s definitely more space and feel a bit different – it’s not completely urban or club music. I never felt like that anyway, that was only part of it, it was never integral to me – I didn’t grow up in a city. It’s not the be-and-end-all of what I do. Well, it seems to pleasantly sit between the two. One last question, how would you describe your sound to a deaf person? That’s a tough one. I suppose I’d put it across in a visual way? A lot of my music – without being clichéd – it’s quite picturesque. You can see stuff through listening to the music; I always felt that’s what people said back to me. It feels cinematic and emotive. Have you created that via the artwork then? Kind of, yeah. Well, there’s reasoning behind the creature. The mask basically came out through an anonymity thing and based around the tribal aesthetic – initially people said African but it was actually Asian that we were thinking of at the time. The creature came out of something we came across in Mexico. It was these woodcarvings and they’re sort of hallucinogenic animals painted in really vivid colours. Originally, they first came about because of this Mexican artist in the 1930s and he started making them with paper-mâché because he had a dream about these weird animals, which didn’t really exist. I really liked the idea that he was evoking this spirit animal. It’s the same thing for me – the mask was sort of the spirit of something, it’s about SBTRKT rather than being a personable human. It also tied into another thing at the time – we read about this study called Cryptozoology, which is the study of things that have never been proved to be real like the Loch Ness Monster. Things that were seen in the early 1900s but no one had a proof they were real – like the Tasmanian Tiger – because they were so elusive. 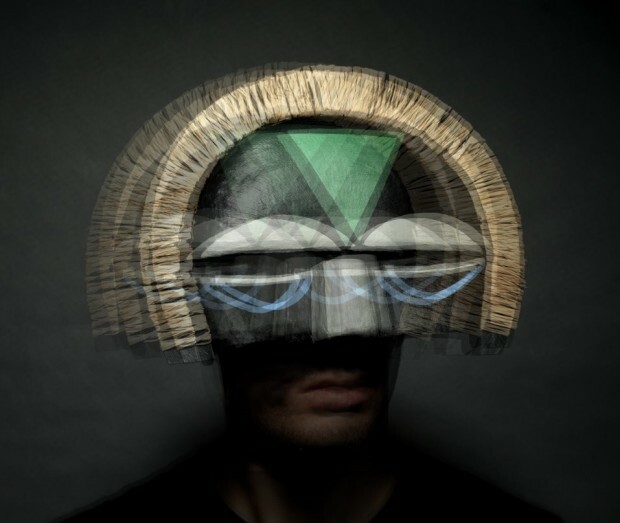 It rings true to the SBTRKT story, so we created this creature that was never seen before. It’s a character of its own that’ll build out in the videos to come. It’s a life for SBTRKT outside of being a masked person.